We will be OPEN on Sunday, May 13th for Mother's Day. A limited Dinner Menu will be available starting at 12:00pm. Reservations are recommended. Congratulations to Dean for winning our #UnderThe22 contest for November/December 2017. Dean posted his picture on Facebook on Thursday, December 14th. Thank you to everyone who participated. 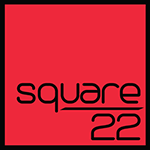 Give the gift of Square 22 to that special someone. Holiday Special - Purchase $200 or more in Square 22 gift cards, receive an addition 10% in complimentary Square 22 gift certificates.